Born at Stridon, a town on the confines of Dalmatia and Pannonia, about the year 340-2; died at Bethlehem, 30 September, 420. He went to Rome, probably about 360, where he was baptized, and became interested in ecclesiastical matters. From Rome he went to Trier, famous for its schools, and there began his theological studies. Later he went to Aquileia, and towards 373 he set out on a journey to the East. He settled first in Antioch, where he heard Apollinaris of Laodicea, one of the first exegetes of that time and not yet separated from the Church. From 374-9 Jerome led an ascetical life in the desert of Chalcis, southwest of Antioch. Ordained priest at Antioch, he went to Constantinople (380-81), where a friendship sprang up between him and St. Gregory of Nazianzus. 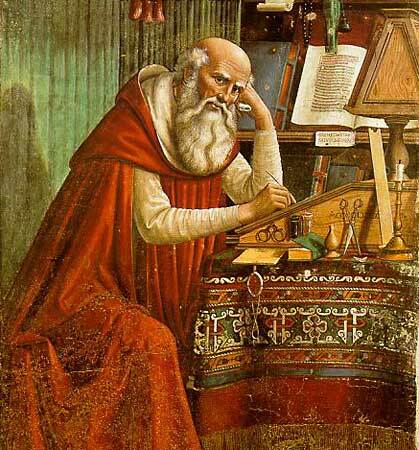 From 382 to August 385 he made another sojourn in Rome, not far from Pope Damasus. When the latter died (11 December, 384) his position became a very difficult one. His harsh criticisms had made him bitter enemies, who tried to ruin him. After a few months he was compelled to leave Rome. By way of Antioch and Alexandria he reached Bethlehem, in 386. He settled there in a monastery near a convent founded by two Roman ladies, Paula and Eustochium, who followed him to Palestine. Henceforth he led a life of asceticism and study; but even then he was troubled by controversies which will be mentioned later, one with Rufinus and the other with the Pelagians.